Imagine the availability of business-critical information anywhere and anytime on your shop floor. Facilitate J.I.T. 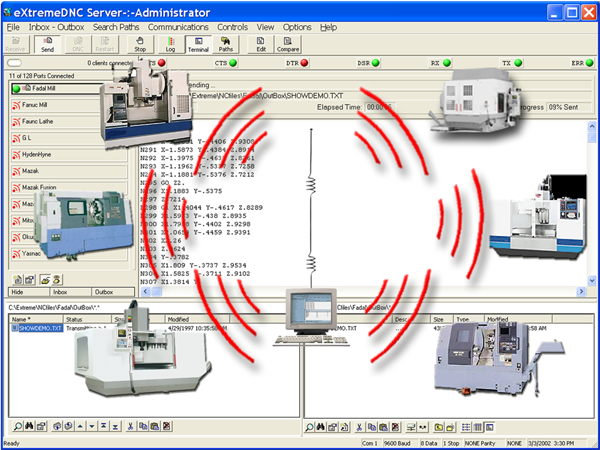 and dynamic manufacturing environments with WireFreeDNC™. Provide mobile employees with convenient access to information such as scheduling, repairs and technical data. If a device fails or breaks only that CNC is affected. A WireFreeDNC™ connection is superior to serial hubs or multi-port devices. Since, failure in the latter can affect multiple CNC equipment, rendering a group of tools without communication. Installation of the Wireless device in a CNC internally provides protection in a manufacturing environment.